Hrm. I'm not as much of a fan of this volume. Though it seemed great to see Harmony (and Clem!) again, I'm not sure I bought the popularity of her reality show where she's out as a vampire, exposing that to the world, and where she depicts slayers as evil. Sure, I know there are lots of bad reality shows out there and people who seem to love them, no matter how stupid they are. But at some point it seems unrealistic that the personal attacks (murders?) don't come under more suspicion. And this was NOT the way I'd expected the entire world to learn about the existence of vampires and slayers. That's such a HUGE shift in the entire Buffyverse, and it's done as a kind of side effect in a stupid reality show? Not a fan of that. 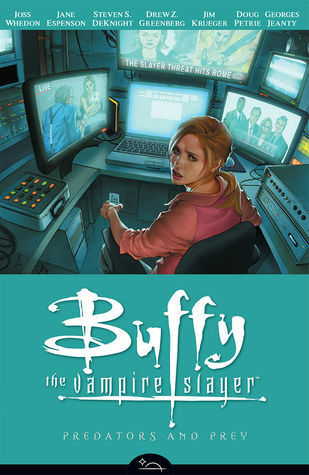 And then there are other kind of related side plots... murderous toys, Andrew as a watcher (mixed feelings on how that was handled as well, though I appreciate Buffy's confidence in him and her actually telling him so), moments with Kennedy and Satsu and lesbianism, etc. This volume didn't do much to further the overall plot and messed up the entire world in the process. Not sure why, but maybe that will become clear in future volumes?